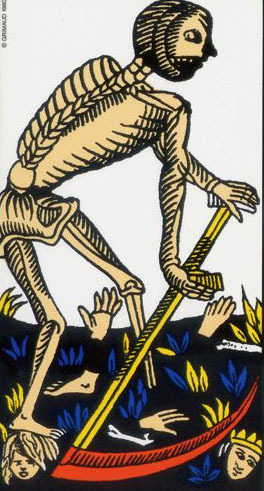 Death is the thirteenth Major Arcana card. 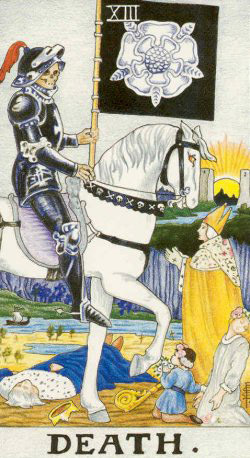 It is named Death in Rider-Waite tarot deck and in Aleister Crowley’s Tarot of Thoth, but other decks, especially the Tarot of Marseilles, omit the name from the card. Therefore, it is also known as L’Arcane Sans Nom – Noname Arcana. We’ll see how Death (or Noname Arcana) is interpreted by four important masters of tarot: the British occultist A. E. Waite (1857-1942), the Russian mathematician and occultist P. D. Ouspensky (1878-1947), the English occultist and ceremonial magician Aleister Crowley (1875-1947) and Spanish-born French occultist Papus (1865-1916). The divinatory meaning of Strength is, according to A. E. Waite, expressed by the following words: „End, mortality, destruction, corruption also, for a man, the loss of a benefactor for a woman, many contrarieties; for a maid, failure of marriage projects“. 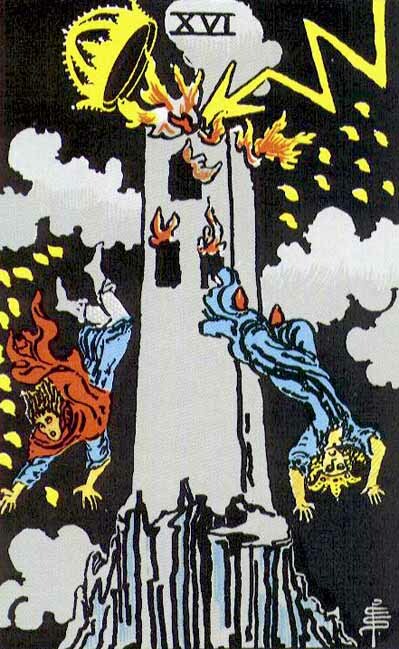 When it is reversed, this card can signify: „Inertia, sleep, lethargy, petrifaction, somnambulism; hope destroyed“. 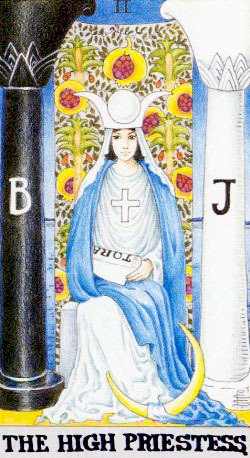 In his chapter about the doctrine behind the veil, Waite explains this Greater Arcana as follow: „There should be no need to point out that the suggestion of death which I have made in connection with the previous card [the Hanged Man] is, of course, to be understood mystically, but this is not the case in the present instance. The natural transit of man to the next stage of his being either is or may be one form of his progress, but the exotic and almost unknown entrance, while still in this life, into the state of mystical death is a change in the form of consciousness and the passage into a state to which ordinary death is neither the path nor gate. The existing occult explanations of the 13th card are, on the whole, better than usual, rebirth, creation, destination, renewal, and the rest“. „A deadly cold enveloped me. The heavy hoofs of the horse seemed to step on my breast, and I felt the world sink into an abyss. But all at once something familiar, but faintly seen and heard, seemed to come from the measured step of the horse. A moment more and I heard in his steps the movement of the Wheel of Life! An illumination entered me, and, looking at the receding rider and the descending sun, I understood that the Path of Life consists of the steps of the horse of Death. Ouspensky also receives explanations from the Voice: „The sun does not think of its going down and coming up. What does it know of earth, of the going and coming observed by men? It goes its own way, over its own orbit, round an unknown Centre. Life, death, rising and falling–do you not know that all these things are thoughts and dreams and fears of the Fool“. Aleister Crowley connects Death with the Hebrew letter Nun and with the zodiacal sign of Scorpio, ruled by Mars. In alchemy, this card explains the idea of putrefaction, „the technical name given by its adepts to the series of chemical changes which develops the final form of life from the original latent seed in the Orphic egg“. 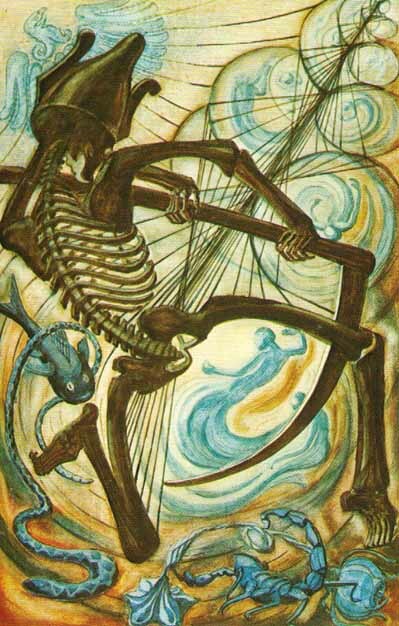 Further, Crowley explains why there are also saturnian symbols in this Major Arcana: „The card itself represents the dance of death; the figure is a skeleton bearing a scythe, and both the skeleton and the scythe are importantly Saturnian symbols. This appears strange, as Saturn has no overt connection with Scorpio; but Saturn represents the essential structure of existing things. He is that elemental nature of things which is not destroyed by the ordinary changes which occur in the operations of Nature“. And a final suggestion, from the English magician: „This card must then be considered as of greater importance and catholicity than would be expected from the plain Zodiacal attribution. It is even a compendium of universal energy in its most secret form“. „The ideas expressed by this arcanum are those of destruction preceding or following regeneration“. God the transformer – THE UNIVERSAL TRANSFORMING PRINCIPLE – destructive and creative. The negative of realization – DEATH. The Astral light accomplishing the function of the Creator – THE UNIVERSAL PLASTIC FORCE (Balancing death and the transforming force). Share the post "Death (Noname Arcana) – Major Arcana Tarot Card Meaning, according to Waite, Ouspensky, Crowley and Papus"